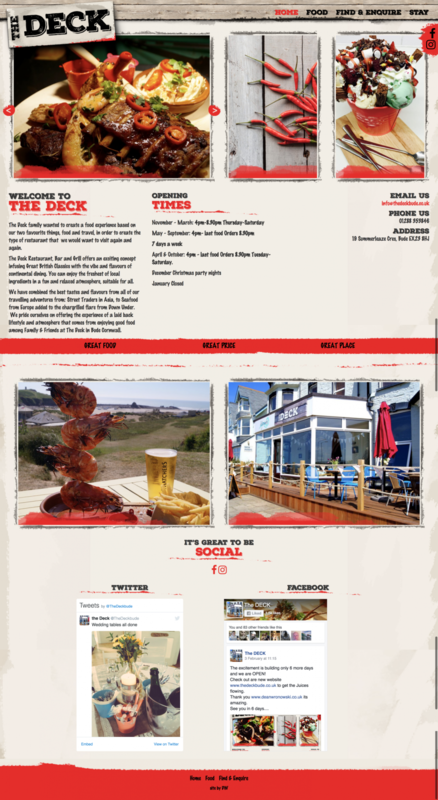 The Deck approached me to design and develop a new website before the reopening of the restaurant for the New Year. They requested that the new website to cover more of the screen regardless of whether they are on the desktop, tablet or mobile whilst still utilising the wood textures they use on their menus. Although they requested for the wood texture to be used, I felt this wouldn’t be enough to give contrast to the different layers. I decided to follow the rough effect of the wood by using a red brush that draws rough strokes to give attention to certain elements on the website. This got applied to the page titles and slideshow overlays. If you are looking for a North Cornwall Website Designer, then free feel to contact me using my contact page to discuss your requirements. We have been working with Dean for several years and we could not be happier with his service and help. Being a small business without much time to sort out our website needs we really appreciate dealing with someone who has taken the time to understand what we do and how this relates to the crazy ideas we sometimes have regarding our website and how it it used. Dean has given good advice and when things need sorting out he is very prompt and the work gets done very quickly. We recommend Dean’s services to everyone.